If you have been a regular visitor to my site, my apologies for the delays in blogging as I have been preoccupied with promoting a new method of making bread - The Batter and Dough Method which I am giving away freely without applying for any patents so that many people can benefit from the technique. Actually I never expected to attempt to forecast the Brent crude price trend as I have been working on trying to forecast the price trend of Palm Oil and Soy Bean. I started off with Rapeseed trend instead of Brent crude trend. After a few weeks of correcting myself I decided to have a look at Brent crude price trend and check if the price of Brent crude was influencing the price of vegetable oils. When I did my 2009 to 2011 prediction charts, for many commodities, way back in October 2009 I had used a simpler method. I have two methods, at least, to visually predict price trends and when I did the commodity charts in October 2009 I had used the simpler method. So something was missing in some of my predictions - some appeared to be in error. I have corrected some of those predictions and plan to publish them soon with new predictions until 2014. Having gone through another round of commodity price forecasting I am a little bit wiser to take into account additional factors. It is still not easy to forecast price trends and what with big boys watching over your shoulder to take advantage of the predictions or to defy you and make your predictions look erroneous, and the TV media spewing out all sorts of false stories to move the market in the opposite direction, it is a wonder I have got this close. It really is amazing. Next time I think I should keep my predictions a secret until some time has passed but I am not keeping this oil chart a secret. I do plan to monitor the Brent crude price trend and update my forecast of Brent crude price trend more often than I have done previously for my other charts. This is because I suspect there is an additional underlying move that makes it necessary to update the charts every one to two years. ... we live in volatile times. From the chart above you can see that the blue line is the historical price trend until November 2012. Prices are quoted as at end of the month ranging from 27th to 31th of the month. From the chart you can see that price trend could fall below $80 by 2014. This does sound realistic as Canada sands and cheap gas in the USA does give a clue as to where petroleum prices will head in the near future - downwards. I will only be able to confirm a major downward trend has begun after March 2013. What if the downward trend does not occur? I can't see a major downward trend except this thing that the Europeans are doing - shooting themselves in the foot ... both feet. 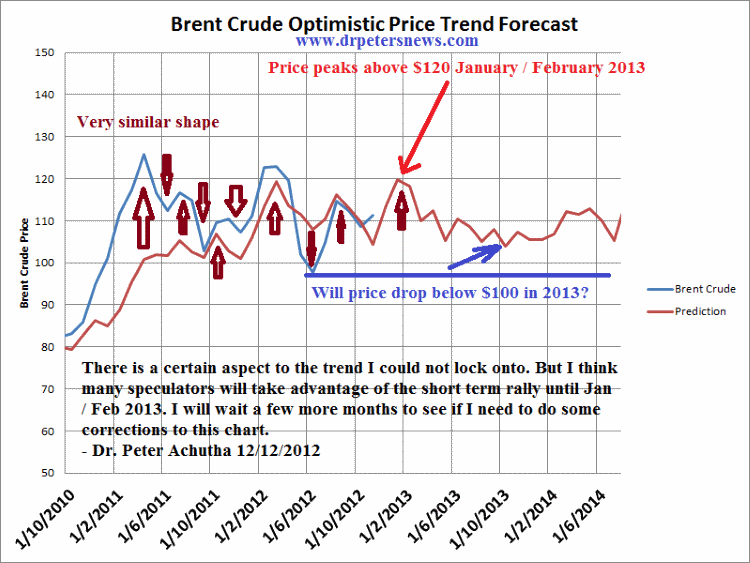 If there is no downward trend then the Brent crude price is under going a mini bull rally until February 2012. The price could hit above US$120. And we all know what that means to our pockets and petrol tanks. But the good news is that after February2013 that Brent crude oil price should come down sufficiently to spur economic growth world wide. 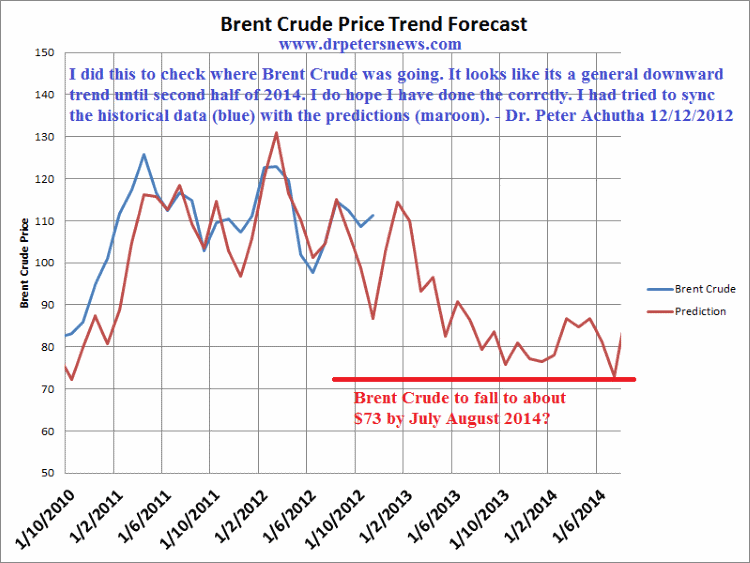 I will monitor this Brent crude price trend and update the charts accordingly. It would probably be after April 2013 before I look at the price trend again. Forecasting trends is a very slow and time consuming process but you end up learning a lot more than you expected and to begin to notice side issues that affect everyone and every thing. I really do hope that this time around I have done the charts correctly and they are realistic enough to be of practical use to everyone.